Wondering how you can stimulate business growth for the future? Courage! there is good cheer in store for you my boy. The Scenographe offers you a broad range of economic opportunities and of great impact by taking your message to a targeted public! We have over 15 years experience in collaborating with theatre professionals the world over. 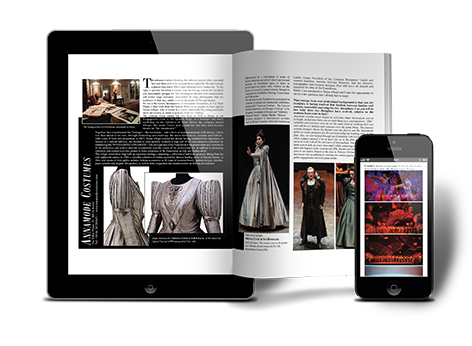 Since the magazine’s launch in 2002, The Scenographer has become one of the world’s most respected quality publications on theatre design, recognised by entertainment industry professionals and aficionados alike. The Scenographer stands out as being one of the few magazines that publish exclusive monographic issues on theatre designers from around the world. Our wide-ranging coverage of every aspect of theatre. Our publication is international; we have links not only with Europe and the United States but also with those oriental countries that have a solid tradition in theatre and opera. In order to best exploit this channel of communication, The Scenographer strongly recommends a campaign based on a series of advertorials specifically designed to attract maximum attention. Full page € 650 / Doppia pagina € 850. Opt for multimedia advertising, in a single format: a full page with the option to book a double-page spread to give your products heightened visibility. Guaranteed a prime position. Advertisers can increase visibility of their multimedia ads by adding multimedia options to their ads. Video clips, hypertext links, audio files, interactive environments. Multimedia ads increase reader interest and prospective clients. Our graphics team is at your service to create clean and captivating pages. We follow the product at every stage of its application and development, with the capability to update in real time. As a plus to advertise in the digital and print editions, your ad can be combined with a targeted campaign on our website to maximise its impact. Book an online ad campaign on our website and on our newsletter mailed monthly to over 600 industry professionals. Combined with the classic banner – opt for static or dynamic – we create contextual ads that are effective in guiding the user towards more info on your product specifications and services. Every banner links up to our clients’ business pages. Minimum booking one month. Two-month booking: 15% discount. Three-month booking: 30% discount. Do you need the banner to stay online on our home page for a year? Write to us we will try to satisfy your needs. Rate per month € 450. Banner on all main pages of website + contextual news and info. Rate per month € 650. Material for advertising: files in PDF format resolution 300 dpi. Please send material via ftp site WeTransfer ( https://wetransfer.com/) to email info@thescenographer.org Write in subject field : Advertising material for THE SCENOGRAPHER.